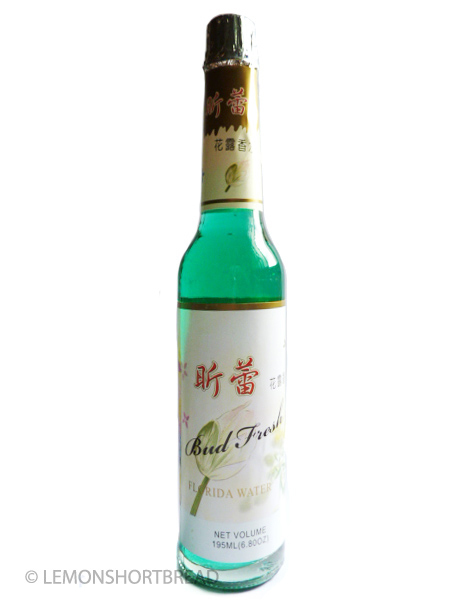 Curiosity got the best of me when I saw this obscure Chinese Florida Water called Bud Fresh Florida Water 《昕蕾花露香水》 going for S$2.00 (about US$1.60). I have been wanting to get the classic Two Girls brand Florida Water but this was cheap and just... there. Florida Water is an American cologne water, with a sweet orange, spice and floral scent, created in the 1800s by Robert I. Murray. 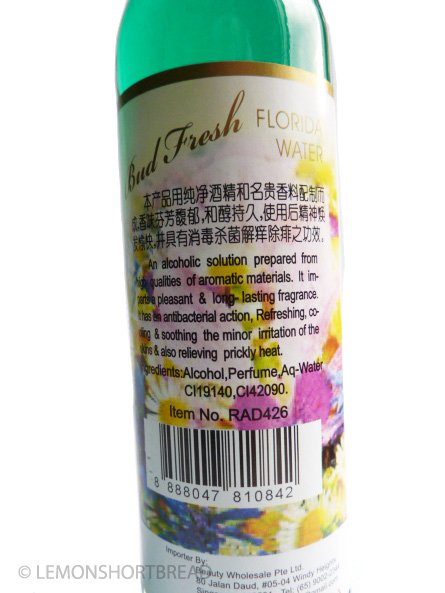 Florida Water from China was created since the early 1900s, with Two Girls brand (Hong Kong) being the most famous. You can read more about Florida Water here. The liquid is emerald green, which is a little uncommon. I always thought it was green glass. It contains alcohol, perfume, water and colouring, CI19140 is a synthetic lemon yellow and CI42090 is a synthetic brilliant blue. The packaging: See the floral image rolling towards the right? Yea it's pixelated...! They probably stole it off the internet, and the chinese-style water lily with western-style floral painting... no comment lol. The scent: I find it strange, at my first whiff was it reminded me of a sweet smelling Johnson's baby shampoo with a chemical undertone (on my hands, not from the bottle). From the bottle the alcohol and chemical-ish smell is pretty strong. Also maybe baby powder with a chemical undertone. Also reminds me of medicine, or the smell from a clinic trying to mask the medicine smells. It says 'high quality aromatic materials', which could be anything! I'm not quite used to it but will give it one good point: when I left my room and came back the lingering odour (the milder the scent the better) was a bit like the Sam Fong powder. I asked my mom to sniff it slightly and she actually liked it for some reason. Oh well. It is too sickly sweet for me and my choice of scents are usually pure florals... since this has alcohol in it I might use it to clean my toilet floors and counter-tops instead. With my curiosity is now piqued, my mission is to try out the other Florida Water on the market, both Chinese and western. Stay tuned!